The ConQuesT Science Fiction and Fantasy Convention: One of Kansas City’s Best-Kept Writerly Secrets! So it’s no secret that Kansas City has a lot of secrets … for some reason when people from other places come to visit (especially if coming from large cities like New York or LA), they find themselves pleasantly surprised by the abundance of both culture and friendliness in our fair Midwestern town. Over and over again at various events I hear from the out-of-towners how much they’ve enjoyed visiting Kansas City, how it was so much more than they expected, and how they definitely want to come back. Heck, I’ve lived near or IN Kansas City my entire life, and I’M still discovering awesome new stuff the city does throughout the year, or places that have been here forever and I just somehow never knew about. One such discovery only three years ago was the ConQuesT Science Fiction and Fantasy Convention, a fan-run convention put together by our local Science Fiction and Fantasy Society. Although ConQuesT hails itself as “Kansas City’s oldest science fiction and fantasy convention”, and that’s most certainly true, as they just wrapped up their 46th year, I only found out about them a few years ago. And with every year I attend, there are scores of newcomers who say they just found out about the con recently, too. I’m not sure exactly why this is, but I’ve been telling everyone I know about it, because not only is ConQuesT our longest running SFF convention, and hosted by local SFF fans, but it’s ALSO very much geared toward WRITERS of science fiction and fantasy … and horror, of course. Although ConQuesT is not marketed as any kind of “writers conference”, it is by far the most writing-centered SFF convention I’ve ever attended (and I’ve attended several in my day). They regularly have great author guests like Patrick Rothfuss, Brandon Sanderson, and George R. R. Martin, to name but a few, and supplement these with lots and lots of local authors. Yes, the Kansas City area also has a somewhat alarming number of quite successful authors who call the Midwest home, both in the traditionally published and self published arenas. This means there are a plethora of writing-related panels to attend, with everything from worldbuilding and nanobots to aliens and writer’s block, from NaNoWriMo tips to writing groups, discussions on diversity in SFF and strong heroines, how to get your short stories published and how to navigate Amazon’s author algorithms. And if your dear writer’s brain feels like it might explode if you try to cram in any more fantastically useful information spilled from the lips of professional experts, then you can take a break and enjoy the usual SFF convention activities: shopping the dealer’s room and art show, playing a table top game or two or ten, participating in the Masquerade, or sitting in on the fandom-based panels (of which there are also a plethora from which to choose). There is no shortage of fun to be had at this gathering, let me tell you. It is surely one of the best resources any author within a reasonable driving distance has at their disposal. AND, it’s not just for authors of SFF works. We have members who haven’t touched scifi or fantasy, or have barely touched them in their own works, and yet they still gleaned a massive load of helpful advice from this convention. So, my fellow writers … now you know. 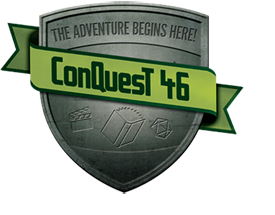 The information for ConQuesT 47 can be found here.